[This] "mystery building" is certainly not there any longer. It was, indeed, the building which housed the "service d'ordre" in the 1960s, and was "outside" the school gates I've mentioned above. It was on an island site, now disappeared because the whole thing has been levelled, which basically formed a one-way system for cars arriving from or departing for route de Chene. 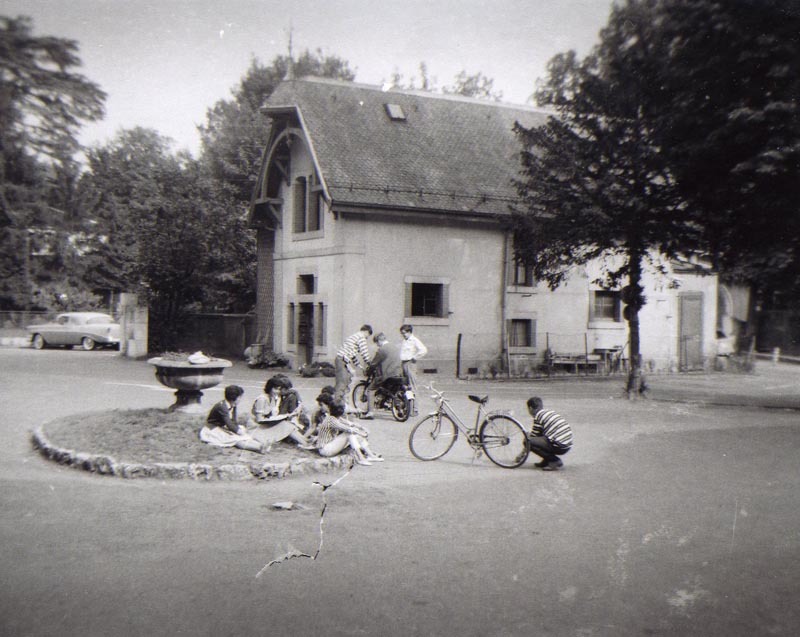 This was in front of the Chateau and the old Primary School, and by the side of the woodwork chalet (which in fact backed on to one wing of the Mlle Hartoch building also referred to above). I think it is an unusual angle of the little courtyard across from the main internat building. And it does look like me sitting there, along with Eve Granger (looking back), Steve North and others. Crouching by the bike I think is John Bachofen, then John Ausman maybe in the white shirt, Fred Howell on the left in the other striped shirt, maybe Ross Ardrey on the bike and I can;t tell about the others. The Chevy is either a '56 or '57 -- you would have to be able to look at the front grill to tell the difference. My husband drove one like this north when he moved to Alaska in '59. Have fun! That's a '56, not a 57 Chevy. I know; the first car I ever drove ... was a '56, owned by the uncle of an Ecolint[ian] from whom we borrowed it. The '57 had distinctly higher fins. As to the building: The Chevy is undoubtedly in the main drag that led from the main gate (to the left of the photo) into the grounds. The magnificent cedar of Lebanon in the background to the left was near, or perhaps on the grounds of, the Villa. Therefore the building at the centre of the photo can only have faced the Chateau. The photo is taken from some 10 meters in front of the Chateau. The building actually hides the main building that faces the late Alexandre. Notice the arrows painted on the pavement: the traffic driveway went around the building to the right -- that explains the position in which the Chevy is parked. In some earlier era the building in question was probably the humble (but dignified) residence of the keeper/gardener of the Chateau; it disappeared one summer -- '57? '58? -- while we were vacationing.